The Manor Farmhouse sleeps 7 and is Dog Friendly. Two living rooms - plenty of space for large families. Very child friendly - a collection of toys and games plus large up to date DVD library. Gorgeous farm-style kitchen with top of the range appliances and very well equipped. Penventinue Manor Farm offers some of the best luxury self-catering cottages on the south coast of Cornwall - located in Fowey (pronounced Foy, as in toy) within an Area of Outstanding Natural Beauty. All five cottages have been furnished to a very high standard and are fully equipped with everything you need for your holiday. They have a modern yet rustic feel with squashy John Lewis sofas and Hypnos beds that will hug you until you fall asleep. We include guest access to the gorgeous Fowey Hall Hotel & Spa where you can use the indoor heated swimming pool and hot tub plus 10% discount on Spa Treatments. Manor Farmhouse - our largest property sleeping 7 people in 2 double bedrooms, 1 x twin and 1 single. It has a Farmhouse kitchen/diner with Aga and separate fan oven, 2 family bathrooms with large walk in showers plus 2 living rooms - plenty of space for the kids and adults! The back door leads out to a family BBQ terrace and huge private fenced garden. Blackberry Cottage - sleeps 6 and is joined to Pond View Cottage by The Garden Room. This was once the long cow milking barn and both cottages have kept many original features. Blackberry sleeps 6 people in 3 x double bedrooms. One bedroom and shower room is on the ground floor. An open planned, light and summery cottage it has a private al fresco terrace but doesn't have a private garden, however with 5 acres of grounds & gardens to enjoy you have lots of outdoor space! Pond View Cottage - sleeps 4 in 1 x double and 1 x twin. It has an interconnecting door to join The Garden Room giving another double or twin bedroom and large bathroom. There is an additional small cost to add The Garden Room - please enquire. Pond View Cottage has a Cornish cottage rustic decor and is ever so cute & snug. It is also Dog Friendly. Again open planned living area and the master bedoom has an enquite with bath & shower. There is a further shower room next to the twin bedroom. It also has a private raised dining terrace and private fenced garden and herb patch. Wild Thyme Barn - our very cute & romantic cottage that sleeps 2. This used to be the piggery! Such a sweet cottage with some original features. It's a long cottage with the four poster bedroom at one end, bathroom, then the open planned living room, dining area and galley kitchen. French doors open out onto the al fresco dining terrace. It also has a private garden with garden furniture. Orchard Cottage (not listed on here yet) - sleeps 2 people and is our latest addition and is very different to the other cottages, giving a more modern and colourful decor. Orchard Cottage is located at the rear of the Manor Farmhouse and can be hired in conjunction giving accommodation for larger groups of 9 people or can be hired on it's own - perfect for 2 people. It is a very quirky cottage with the kitchen-diner being accessed via external steps to the living area and bedroom. It has a huge private orchard plus a private walled courtyard with dining furniture - so much outdoor space with this property. All the photos in the Gallery are a combination of all the Cottages here - please read the Image names to see which cottage they are. All cottages have barbecues and top of the range garden furniture, washing lines, complete laundry facilities, WiFi and secure parking on site. We also provide a Welcome Hamper containing a variety of convenience items, such as, kitchen roll, washing up liquid, cloths & sponges, cling film, tin foil, Salt & Pepper, hand soap, toilet roll and Ecover cleaning products. When staying 5 or more nights it also incoudes Wine, Milk, Tea, Coffee, Sugar & Biscuits. We provide a Dog Box containing convenience items for your holiday. There is a large herb patch in the main square and seasonal vegetables are available from our veggie patch. 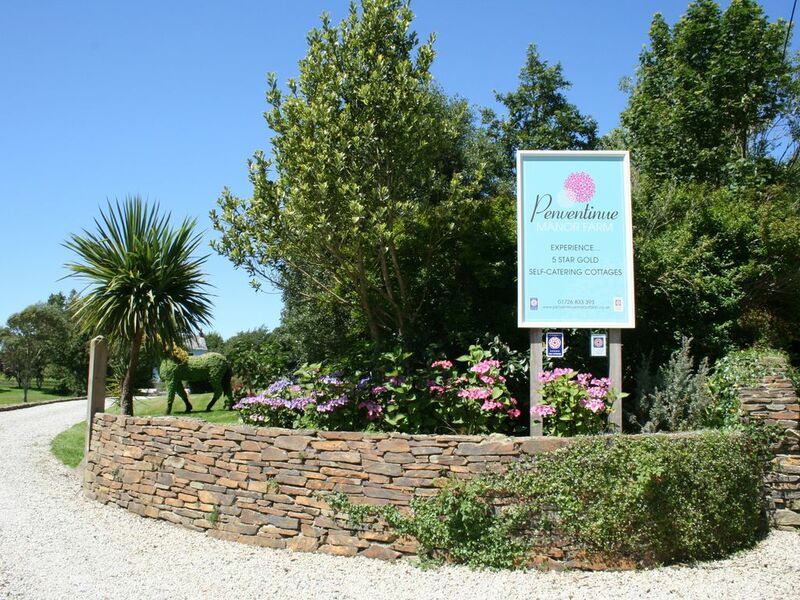 Whatever type of holiday or break you seek Penventinue Manor Farm is the perfect destination and offers excellent accommodation for family holidays, groups of friends or romantic weekends. Come and make yourself at home in an idyllic and utterly unique converted barn where freedom and relaxing space is on tap. Penventinue Manor Farm is a truly tranquil setting, with five acres of lovingly tendered lawns and gardens; Wildlife roams and Wildflowers grow in abundance, giving you your very own private pocket of Cornwall. With refreshing countryside strolls and breathtaking cliff path walks on our doorstep and being conveniently situated on the South Coast of Cornwall we are within easy reach of many popular attractions and places to visit. Fowey is a delightfully picturesque and unspoilt small town and port that nestles in a valley on the west bank of the River Fowey. This area is ideal for those who wish to visit all parts of Cornwall while staying in a quiet and relaxing environment. It offers particularly good walking country and is home to many of the country’s best gardens. Beautiful unspoilt countryside, criss-crossed with delightful walks and steeped in history, the farm at Penventinue (pronounced ‘Penn-ertinny’), was recorded in the Doomsday book. Within easy walking distance of the town yet set in distinctly open countryside it’s truly the best of both town and country. If you have a boat and would like to bring it, it can be easily launched from nearby Caffa Mill and we have trailer storage space (please bear in mind that the farm is at the end of a country lane and larger boats/trailers may struggle to navigate the winding turns). The town of Fowey is unique with its compact Fore Street packed with individual shops, including excellent local Butchers, deli and fish mongers, old fashioned pubs, coffee shops and a selection of superb restaurants. Local seafood and farm produce are always cooked to best effect in convivial surroundings whether you want a young, hip joint or a more relaxed, classical vibe. Louise manage's the business for the owners and lives locally so you can tap into her local knowledge. She works in the office at the farm some days and is contactable on her mobile at any time. The property was purchased simply because it is located in one of the most beautiful, relaxing areas of the UK - Fowey on the south coast of Cornwall. The cottages are nestled in stunning countryside within Areas of Outstanding Natural Beauty and with sea views. The locals are incredibly friendly and cannot do enough for visitors to Cornwall - that's how they made us feel every time we holidayed to Cornwall which is what helped with our decision to move here. The cottages are less than a mile from the unique fishing town of Fowey, with easy access to the many famous and award winning attractions and other popular areas of Cornwall. We have 5 acres of gardens too - giving the best of all worlds. Louise is on call for guests any time of the day and lives locally which helps provide guests with round the clock assistance, peace of mind, advice and recommendations. She has extensive knowledge of Cornwall and can organise anything that you need or wish for, from a private Chef to tickets for local attractions, a local produce hamper for a special occasion or a birthday cake. Having gardens and parking and being located on a quiet private road makes for a very convenient and happy holiday, yet we are just a stones throw from Fowey and other main towns and areas of Cornwall. Notes on accommodation: Some bedrooms are on the ground floor, along with bathrooms and shower rooms. All beds have top of the range Hypnos mattresses with The White Company bedding, linen and towels. Some of the superking beds can be split into 2 large double beds. Outside: We have 5 acres of beautifully manicured lawns, flower beds and wild gardens for our guests to enjoy. At the lower end of the gardens are 2 large ponds, teeming with fish, wild ducks and birds including a beautiful Heron and Kingfisher who live somewhere near by. We have a badger sett with babies born here every year plus a hedgehog village. Every cottage has it's own private terrace and garden area with Barlow Tyrie garden furniture, tables and parasols. We also provide each cottage with large charcoal BBQ's and utensils. We have membership with the local award winning Spa the Fowey Hall Hotel & Spa, located less than a mile away. It has a heated indoor swimming pool and outdoor hot tub with the best views on the south coast - all for our guests to enjoy plus discounts on beauty treatments and products. This was our first time staying at Penventinue Manor Farm and we could not have been more impressed. We stayed for a week in October with our Cocker Spaniel and it didn't take long for the Farmhouse to feel like home. In advance of the trip we were looked after by Lou who provided fantastic information on the property and the local area and was a pleasure to deal with. The Farmhouse is a lovely mixture of grand and homely, the kitchen has almost every cooking implement you can think of, we actually stayed in most nights as it was so well stocked. The master bed was very large and exceptionally comfortable. The house was clean and smelled wonderful on arrival, just what we needed after the drive down. The Farmhouse has a very large fenced garden which was absolutely perfect for our crazy dog. If staying I would definitely recommend a trip down into Fowey (rhymes with joy), it has lots of lovely little shops and some excellent doggy friendly pubs! All in all the perfect stay, I would recommend this property to anyone! Thankyou so much for your lovely review Sally. It was an absolute pleasure having you to stay. Fowey is very dog friendly - actually we are very lucky in Cornwall, you can even take your dog into most shops too. There are some lovely features of the house but, for us,a few too many detractions to be 5*. The property was clean internally but is getting shabby outside, needing repainting in bits (especially windows) and some TLC. Whilst there are some high quality furnishings (and the Aga was a delight), there are a few bits that need repair - a door handle came off, the sun umbrella is broken, a few bits in the bathrooms aren't quite right. The garden is a great resource for a dog but our cockerpoo found a couple of routes out! The kitchen is adequately equipped but a little thin on crockery, cutlery etc...enough, but for 6 people, you have to dishwash after every meal even if you only need a couple more plates. The glassware is very posh...but you can't dishwash it. It's a holiday, we would have much preferred some good but dishwasher safe stuff rather than having to get the rubber gloves on. The caretakers / cleaners were friendly and accomodating but the external bins were full so we had to shuffle bottles / rubbish around - probably our fault for not mentioning the problem earlier. Fowey is delightful (but busy) and a bit of a trek from the house; Golant has a good pub and is a nice dog walk to it (an example of a walk that could have been documented for visitors); the ferry across the river in Fowey gives more walking options andslightly further afield are good walks and good tourist spots. Overall, it was pretty good but we've stayed in better equipped and maintained at similar to lower cost. We have closed the Manor Farmhouse for the next 3 weeks for a complete redecoration outside and inside. We do this every 2 years and has to be at the end of the season as January to March the weather is not always on our side and then we are into our season so unable to do it until now. The door handle I think you are referring too, isn't a door handle =as such - it's a decorative one. Thank you for making our gardener aware of the umbrella. Unfortunately this was the first time any of us were aware of this so presuming this has been damaged by previous guests and patched up. These things happen but I would always prefer to be made aware so I can replace items for our next guests. A new one has been ordered from Barlow Tyrie. The 2 keys is a good idea which is easy to implement and something we shall do. We have a large selection of maps and suggested local walks in the main Office - the black information folder in the property advises of this. It includes the one you mention to Golant and what a great walk that is! We are grateful our guests recycle so much and that week the bins were quite full so apologies for that - after you highlighted it our caretaker emptied them. The walk into Fowey is just under a mile taking some guests just 15 minutes. When I did the walk it took me 25 and a short taxi back at around £4. Most guests prefer being just on the outskirts so they have the best of both - the choice to go into Fowey or the quietness of the semi-rural location. The week you were with us was the Fowey Royal Regatta week so the town is always busier than normal as is a very popular time for visitors and locals alike. Six of us stayed in the Manor farmhouse, which was furnished to a high spec and had lots of room for us to spread out. The only issue was the open fire which blew back and left not only the downstairs smokey but also us and our clothes. We needed a fire as it was still cold in the evening. It would have been so much better with a log burner. Most of the heat from the fire went up the chimney but the smoke filled the room! Apart from that and the very dodgy wifi connection and non exsistent phone signal ( also no landline which was a bit worrying as nobody could contact us at all in an emergency ) we loved the accomodation and location. Walking to the village was more of a hike and took more than 20 mins. Walking back was an uphill marathon. It's definitely a place we will return to. Thank you very much indeed for your Review and kind words. Sorry about the fire situation. When it's cold its best holding a hairdryer up the chimney for a couple of minutes to warm the air inside which prevents a back draft of smoke as you experienced. I'll pop that handy tip in the cottage information for other guests. Vodaphone unfortunately doesn't work at the cottages given the thick granite walls and location - other networks seem to be OK, O2 especially. Most self catering properties do not have landlines but the Wifi is usually OK and other guests suffering with lack of phone signal have made free calls over the Wifi OK. The Wifi weakens when there are several people connected to it, downloading large files or watching films etc - as with anywhere. The farm accommodates 21 people at peak holiday times and most people these days have iphones and ipads all running at the same time. My mobile is advertised on the website and 3rd party sites too, so if anyone needs to contact one of our guests and cant reach them for whatever reason, I would hope they would think to call me. It takes approximately 25 minutes to walk into Fowey - this timescale I have taken from previous guests over the years and I have walked it too. Some people take longer, some only 15 minutes. It's only 0.8 miles into Fowey. It is a slight incline coming back, it's not hilly at all and takes an average of 35 minutes to walk back. Manor farmhouse is a truly fantastic place to stay and is presently to the highest standard through out. Every thing has been thought off to ensure that your stay is relaxing and enjoyable, being a 20 minute walk to Fowey town centre but set within its own grounds away from noise of the seaguls, it is a peaceful and beautiful place to sit and enjoy the surroundings. Joli cottage confortable. Grand jardin très bien entretenu. Proche de plages. Thank you Nicole for your lovely review. It was a real pleasure to have you stay with us and hope to welcome you back again one day soon. Trains direct from London Paddington stop at Par & St Austell regularly - taking only 3.5 hours. Cars are not essential but if you want to travel around the local area it is recommended. We have the Saints Way and South West Coast path on our doorstep - great for walkers. We have been awarded Walkers Welcome, Cyclists Welcome, Pets Welcome and Families Welcome accolades from the Tourist Board for exceptional facilities for all these types of holiday. We are very fortunate to be able to offer our guests the gardens and safe on-site parking here as the majority of Self catering properties in this area do not have those privileges. We can organise boat hire for you - giving you a totally different holiday and way of travel. Everything is possible and nothing is too much trouble - with three people here and available at your beck & call with a huge amount of local knowledge, it makes for a very restful, carefree holiday which is exactly what you deserve!